Everyone starts their day in the bathroom, brushing teeth, doing hair and make-up, or shaving. Whether you spend five minutes or an hour getting ready, a bathroom mirror is essential. Bathroom mirrors come in a range of shapes and sizes, and some bathrooms will incorporate more than one mirror depending on the size of the room, number of people using the space, and personal taste. In addition to the very practical purpose of providing a place to see yourself when getting ready, mirrors are also useful in creating the illusion of more space and reflecting light throughout the room. You may not think this element of your bathroom will make an impact on your design, but the right mirror can be the perfect way to inject personality and style into a bathroom design. For example, a plain, large mirror combined with well-placed lighting creates a glamorous space to get ready. Mirrors can also be framed in a material that matches the vanity cabinet or other elements of the bathroom, or the mirror itself can be a one-of-a-kind piece of artwork for your bathroom in an unusual shape or material. The large mirror in this contemporary design creates the illusion of more space and provides a glamorous look for this room. A plain mirror is more than enough for this bathroom, as it reflects the unique pendant lights and artwork on the opposite wall, putting the focus on these striking design features. 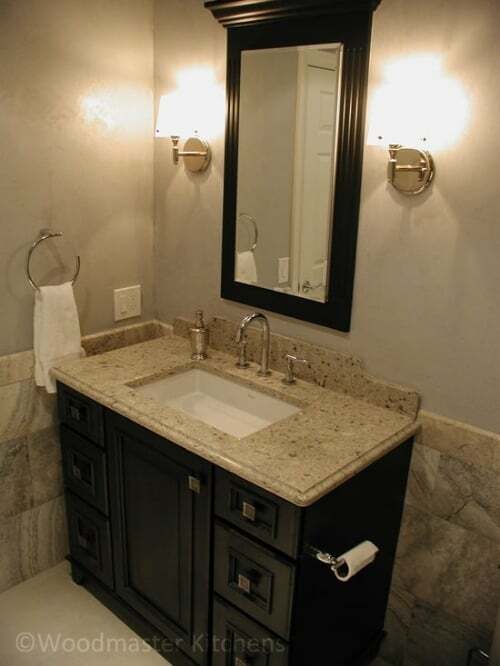 In this design, a large mirror reflects the unique light fixtures, vessel sink, and artwork to create an elegant atmosphere for this bathroom. A mirror framed in the same wood as the vanity cabinet is the perfect addition to this bathroom. The wood tone gives a warm appearance to the design and is complemented by the eye-catching mosaic tile border. Similarly this bathroom remodeling project features a striking mirror framed in dark wood that matches the dark finish vanity cabinet. The contrast of these features against light colored walls, countertop, and sink are an ideal combination. In this design, a white framed mirror matches the white vanity cabinet and contrasts with the dark walls and countertop. 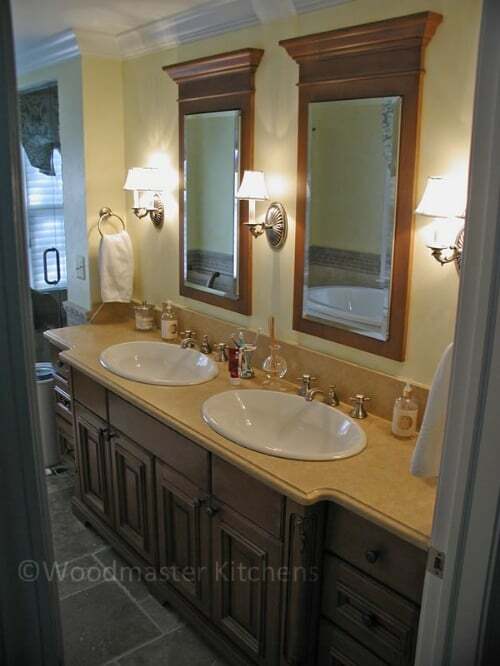 If a large mirror is not your preference for a double vanity, another option is to include two matching mirrors. 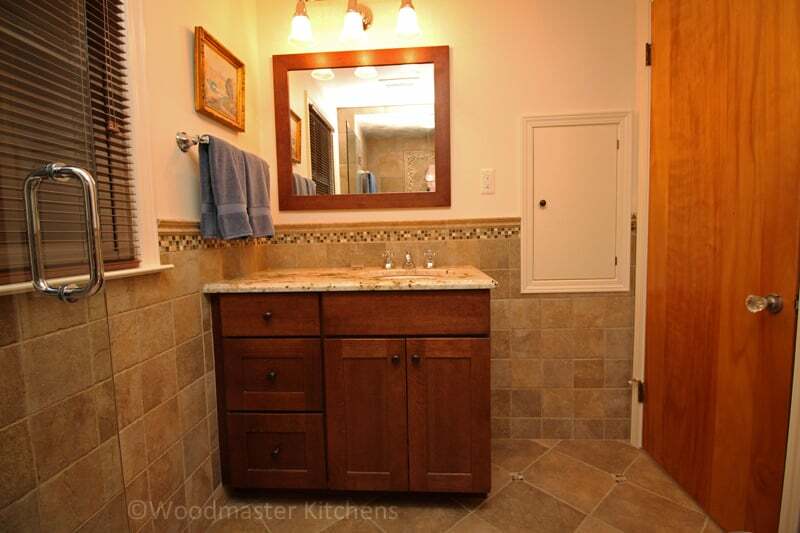 The design pictured below incorporates a mirror above each sink, framed in wood to match the cabinetry. You could also opt to incorporate multiple smaller mirrors in different locations in the room in place of a large mirror. The bathroom mirror is also an easy place to make a statement with a unique design feature that can be more easily changed than tiles or cabinets. A bathroom mirror in a unique shape or framed in an unusual material like one-of-a-kind tiles can turn a mirror into a work of art. Use your imagination, and consider incorporating a mirror framed in a locally sourced material, reclaimed barn wood, or metal. In some cases, the mirror may conceal a recessed medicine cabinet, making it both a stylish and practical feature. This attractive mirror matches the vanity cabinet, and cleverly conceals the recessed Robern medicine cabinet that helps keep the bathroom clutter free. A mirror is a practical requirement for any bathroom, and the right mirror for your room may depend on the type of bathroom, how many people use it, and the size and shape of the room. A bathroom mirror is also the perfect way to bring a bit of personality to the room, in a design element that can be easily changed. 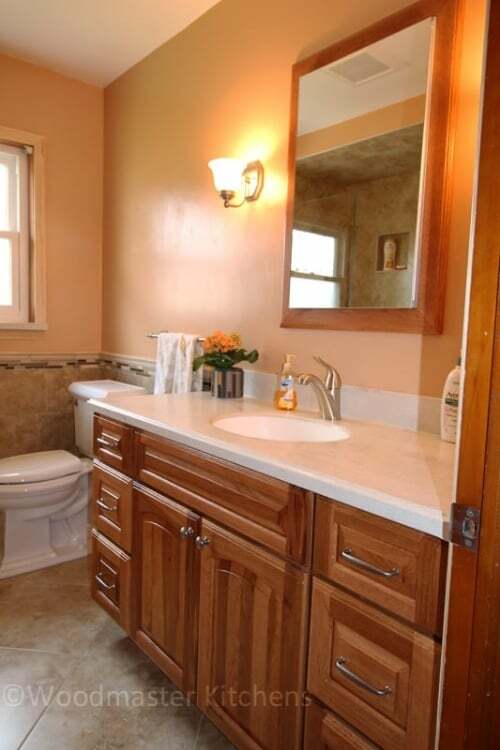 Visit our bathroom design gallery for more great ideas or contact us today to discuss your design needs! 'Tis the Season to be Entertaining!